It felt like starting from scratch. I had just arrived at my dorm room and my first day at Rutgers University was going to start tomorrow. My family had just left. My roommate had yet to arrive. My friends were all many miles away. I had almost no connections and I vaguely recognized only a handful of Rutgers students who went to my high school. Never in these moments did it occur to me that the Rutgers Chabad House would become so integral to my time at this new institution. The usual questions of a transfer student plagued my mind. Will I be able to make friends? What are the professors like? And, of course, how in the world does the bus system work? I had come from a small private school near my hometown. Before I had been able to visit almost every weekend. Now I lived on a campus much too far away to go back anytime soon. I initially tried to adjust by focusing on one goal: enhancing my own future career. Extracurricular activities, bustling career fairs, and resume reviews all captured my interest. I desired success, and was amazed at the opportunities Rutgers offered. However, internally I realized I felt a bit empty. I was only worried about myself, about pursuing my ambitions. Just like poison, such a mindset was making me selfish. Perhaps, it’s not necessarily bad to have dreams, but only chasing after one’s own individual prosperity can be dangerous. That’s when an invitation from a new friend to attend the Shabbat dinner at the Chabad House in Rutgers changed the entire course of my adjustment this semester. I knew what was entailed in a Shabbat celebration, after all I had come from a Jewish background. Unfortunately, a connection with this identity had faded over the years. Holidays and customs we had traditionally observed in my youth were now no longer practiced by my household. Reflecting on the rich sense of community embedded in the essence of such a celebration made me nostalgic. I decided to accept the invitation. I tentatively entered into the Chabad House that evening. Almost immediately, I was warmly welcomed by the Rabbis, students, and others guests. As we gathered around the tables to begin the evening’s prayers, I noticed a few non-Jewish guests attending as well. Apparently, it was their first Shabbat. As we sung blessings over the wine, Challah, and shared stories from the Torah watching these students enjoy a Shabbat experience for the first time moved me. I reflected how this Jewish custom unifies people. That Shabbat dinner was a sharp reminder; life isn’t just about finding another experience to slap on a resume. Truly, community and traditions are also of great importance. After the jokes and celebration of the evening passed, I knew I wanted to become more involved with the Rutgers Chabad House. I quickly learned that there are events held almost daily including classes on Judaism, celebrations, and volunteer opportunities. Personally, I took an interest in service, and now am very grateful for the chance to serve specialized children at the Robin Wood Johnson Hospital along with my new friends. As a transfer student, it had been hard to find such a warm and inviting community on campus, but now I was starting to find my place. 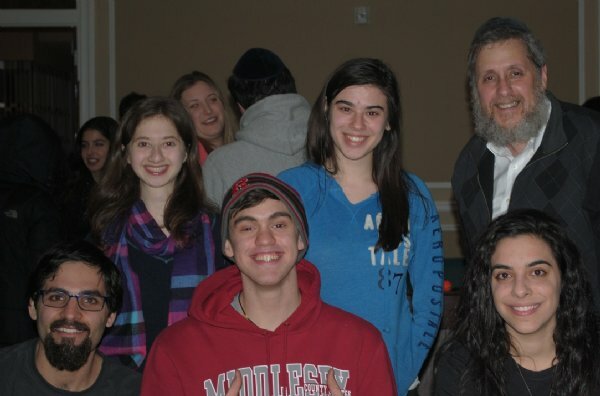 Ultimately, experience in the Chabad House has added something deeper to my time at Rutgers. Participating in its affable culture and community have enabled me to mature my understanding of the greater purpose of every individual towards the betterment of society. Being a transfer has had to take patience. Even though a new environment can be exciting, it can also be lonely, confusing, and frustrating. Attending the Chabad House is an escape from the chaotic cacophony of each day at this new school. Without this solid foundation I definitely would not have been able to reconnect with Judaism, and I most certainly would not be the same Rutgers student.